The screening was courtesy of Marie Claire (thanks guys) and took place at the Charlotte Street Hotel. This is one of my favourite screening locations as it's nice and small and the seats are large and super comfy. 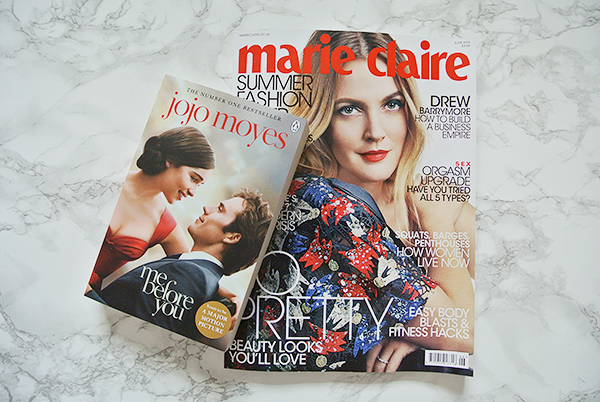 We were treated to pink bubbles and goodie bags at our seat (which included the movie edition of the Me Before You book, a book mark, the latest edition of Marie Clare, crisps, water, dry shampoo, hand cream and some other beauty bits and bobs), before the main event kicked off: a Q&A with the brilliant Jojo Moyes! This wasn't the first time I have seen Jojo as I met her at Penguin's Annual Women's Fiction Evening a few years ago where I gushed to her about The Girl You Left Behind and she was utterly lovely and down to earth despite my likely incoherent gibbering. However, this time around it was (understandably) a lot less rushed so we had plenty of opportunity to hear all about the process of turning her book into a screenplay as well as the inspiration of the story and the casting of Emilia Clarke as Lou (which is utterly brilliant by the way). Jojo said that even after After You Lou's voice is not leaving her, and it's the same for many people who have read her books. When asked why this might be Jojo said "because she resonates with many people; she's kind and doesn't have a mean bone in her body." The most challenging thing of the book to film transformation was what to cut. "It's a technical thing," Jojo said, "you cannot fit everything in a film. There are 120 pages of script as each page is a minute on screen." There are some changes in the film, because "sometimes a joke doesn't translate well or falls flat. Or something uninteresting really comes to live in the hands of an actor. It's a very organic process. As a writer you have to not be so precious". On the casting of Emilia (who was Jojo's number one choice by the way): "Emilia radiates warmth. She has a natural quirkiness and humour." Jojo cried so hard when writing the final chapters of the book that the man next door came to see if she was OK. She said: "If I don't cry, you [the readers] don't cry. You have to feel it and you have to get to a place where there is some integrity. I also laugh at my own jokes." She said she has very little time to read unless she is on holiday. She reads George R.R. Martin, Lee Child, classics, anything she reads to her kids, comic books... She added that she's a completely unsnobbish reader and everyone should read whatever they want, whenever they want. "The first day of filming was really strange," Jojo said. Se explained that she was picked up by a car following James Bond like instructions. She entered an area at the back of Moorgate which had rain machines, food trucks and thousands of extras. And there was Will Traynor in a suit. Jojo said she had considered herself the only authority on Will but there he was, living and breathing. When the Q&A was all over and done it was time to settle in the for the film. I won't spoil anything for you guys, but let me just say that Sam Claflin and Emilia Clarke were absolutely perfect as Will and Lou and I can see why Jojo now pictures these actors when she thinks about the characters. The movie was beautiful and heartbreaking (I first shed tears over the bumblebee tights and it was only downhill after that) and a brilliant adaptation of the book. I don't say this often but this is a film which really captured the essence of the novel and it stayed very true to the story. I think this is due to Jojo's close involvement with the whole filming process (from screenplay to casting and beyond) and her vision shows throughout. This one is going to be hard to beat as my top film of the year. Me Before You opens in UK cinemas on 3 June 2016. Bring tissues. Lots of tissues. Thank you for this very interesting post, Zarina, the book and the film sound fabulous! Thanks for your comment, Liza! I felt so privileged to see this incredible film early, hope you get to see it soon too. Fun info! I had a similar thing happen when I was reading the last few chapters as she did writing them! I was crying so hard I was on the floor crying, and my husband thought I had fallen and really hurt myself! It's wonderful when a book can have such an affect on you, isn't it? Perhaps not in the exact moment, but surely the fact that it can move you so deeply. Hope you enjoy the film at least as much when you see it.